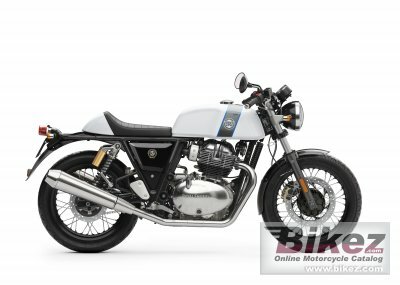 2018 Enfield Continental GT. Picture credits - Enfield. Submit more pictures. The chiseled fuel tank is recessed to tuck in the knees and get the sporty ergonomic riding stance. New age technology and traditional Royal Enfield heritage has been mated seamlessly thus making the Continental GT looks fantastic while riding or parked; and it�s bound to put a smile on your face anytime you lay eyes on it. Front brakes: Single disc. Floating discs. Brembo 2-piston floating caliper. Electrical: 12 volt, 14 Ah battery. Ask questions Join the 18 Enfield Continental GT discussion group or the general Enfield discussion group. Bikez has discussion forums for every bike. View comments, questions and answers at the 2018 Enfield Continental GT discussion group. You can sign up for e-mail notifications when other riders answer you. If you have extensive experience with the MC, please send us a review. If you consider buying this bike, you should view the list of related motorbikes Look at photos. Compare technical specs. And check out the rating of the bike's engine performance, reliability, repair costs, etc. You can compare the rating with other bikes.